LightKulture.com a leader in sustainable LED Lighting is pleased to offer the newly reimagined Cielo Chandelier by Pablo Designs. LightKulture.com is pleased to offer Cielo, Pablo Designs first sustainable flat-panel LED chandelier." The Cielo pendant's simple structure and classic cylindrical shape works well with any style,” noted Susan Inderbinen President of LightKulture.com. The Pablo Studio is a small group of industrial designers with diverse backgrounds who understand the craft of manufacturing, materials and technology. The minimal form, 8 watt flat-panel LED technology is the fixture's defining feature. Cielo can be suspended individually, or in a series of 3, 5 and 7 pendants mounted to a 17” canopy. Cielo also comes as a 13 light pendants mounted to a 26” canopy. The larger the grouping, the boulder the statement. Cielo offers energy efficient LED technology that is fully dimmable and provides glare free illumination. Pablo was founded in 1993 by Venezuelan born industrial designer Pablo Pardo. His studio in San Francisco embraces a “less is more” ideology, developing more practical solutions free of decorative elements. Permanence and sustainability are the common threads of all of Pablo designs. Pablo has a holistic approach to his creative process. The studio’s interest in establishing enduring design collaborations with visionary individuals such as Peter Stathis, Dana Cannam, Carmine Deganello, and his identical twin brother, industrial designer Fernando Pardo. For Cielo to be considered sustainable lighting, it must use a minimal amount of materials, contain no hazardous material such as mercury, and last for 50,000 hours or 25 years of daily use. By using only 8 watts of power, Cielo is 90% more efficient than a comparable halogen light source, and 40% more than energy efficient CFL’s. The art of Cielo is the stylish way it combines design and the science of sustainability. “We have been selling the Cielo single LED pendants since they were introduced in 2012. The matte white finish with accent trim and coordinating fabric cords are available in 6 painted finish combinations: all white, white with turquoise accents, white and moss with copper fabric cord, white with tomato trim and copper cord, all grey and all black. With so many requests for a polished aluminum finish, we are very excited to announce this finish is now available. Even better, the pendants are now offered in multiple configurations 3, 5, 7 and 13 pendants all on one larger white canopy. These new LED multiple chandeliers offer dramatic lighting configurations for residential and commercial settings. The fully dimmable, glare free 8 watt, flat-panel LED’s come in 3000K, 380 lumens and a CRI of 85. With the holiday season rapidly approaching, there is still time to add beautiful lighting to your home. You will impress your guest with the sparkle and ambiance of dimmable LED lighting as the centerpiece of your holiday table.” noted Susan. 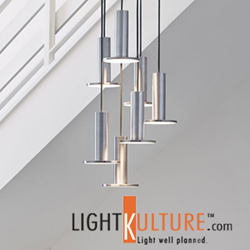 At LightKulture.com, our mission is to offer the finest energy efficient contemporary lighting and light fixtures from around the world. We have assembled an exciting collection of the industries most innovative decorative and architectural lighting.We are proud to offer lighting solutions for both your home and work-life environments. Simplicity is design is complicated, function makes it last. Be inspired by our range of essential designs from well respected American and European manufacturers. In today’s world, energy efficient lighting is as important as eco-friendly or green lighting fixtures, such as LED or CFL lighting. We offer the very best energy efficient lighting and light fixtures, both high value LED lighting fixtures and CFL lighting fixtures in modern and contemporary styles that provide quality, innovation and authenticity.